Cu, TCu, Cb – Generally severe but may be catastrophic and include the downbursts described below and the internal up/downdraughts. Thunderstorms may be classified in four generalised types – single-cell, isolated multicell cluster, multicell squall line (refer 9.6 below) and supercell, although supercells are also multi-cellular. Their associated surface winds may be both high velocity and extremely turbulent, originating from the downdraughts of cold, dense air. When thunderstorms are about light aircraft should not be airborne. Single-cell storms are usually isolated storms moving with the mid-level wind, common in summer and occurring in conditions where the wind velocity, relative to the cell motion, does not change markedly with height. (Cb development has to be strong to overcome the detrimental effects of vertical wind shear). A single cell storm may last less than 30 minutes, its life being limited to the growth and collapse of a single updraught pulse. The diameter of the storm may be less than one nautical mile and it will not move very far in its lifetime – less than 3 nm in light winds. Such storms do not usually produce violent wind shear near the surface although microbursts may descend from even a mild looking Cb. Isolated single cell storms, embedded in low level cloud layers, commonly form in cold winter air streams. They are generally frequent, but short-lived, with soft hail and shallow wind gusts, and caused by de-stabilisation of the cold air mass. They can be accentuated by orographic effects. Multicell cluster storms, the most common, consist of a series of updraught pulses (cells) which may be separated by time and/or distance and be closely or widely spaced but moving as a single unit. They may cycle through strong and weak phases, strength being indicated by closeness of pulses. Frontal, pre-frontal, heat-trough and convergence zone systems may produce very vigorous storms several miles wide and, by continually propagating new cells, last an hour or more before the cool outflow finally undercuts and chokes off, or smothers, the warm inflow and the system collapses. Each new cell is usually formed in the zone of maximum convergence where the gust front directly opposes the low level wind. Weaker multicell storms advance with or to the left of the prevailing mid-level wind ( i.e. that about base height plus one third of the cloud depth) at an average rate of 10 knots or so, but the strongest storms may turn almost at right angles to the wind. Cells will move with the prevailing mid-level wind but because of the wind change with height the new cells form on the left, if the wind backs with height, and on the right if it veers. Thus the storm turns towards the flank where the new updraughts are building – the flanking line, which is a line of Cu or TCu stepped up to the most active cell. If the new cells are forming on the upwind side, usually to the west or north-west – a back-building storm – it may appear to move slowly, possibly staying in one place for considerable time. 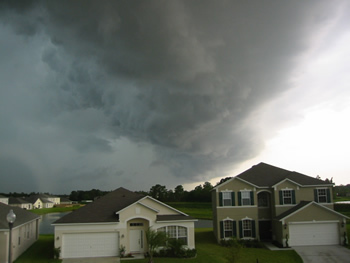 Strong updraught / weak downdraught storms often form in conditions where there is moist air at most levels. Such storms produce heavy rain and may produce severe hail but, because of the lack of dry air inflow, severe low level shear is unlikely. In severe storms, with strong updraughts and downdraughts, updraught velocities increase with height, typically 1500 feet per minute at 5000 feet and 3000 feet per minute at 20 000 feet. Updraughts of 5000 feet per minute in the upper part of a storm are not unusual. Downdraught velocities tend to be slightly less at corresponding altitudes. Vertical acceleration loads of 2g to 3g may be experienced in horizontal flight. The areas which most concern light aircraft are the low level outflow regions where downburst gusts of 50 knots plus may be reached in the line squall. The spreading density current of the outflow may last for 10 to 30 minutes and be 1500 to 6000 feet deep, forcing the warm, moist low level air up and so continuously regenerating the updraught. Thus an area up to 25 – 30 nm from a large storm, and 15 – 25 nm for a medium storm, should be regarded as absolutely a 'no-go' area for light aircraft. An intense narrow initial microburst may sometimes be produced, bringing short-lived wind gusts of possibly 100 knots or more. There is an area of extreme low level shear at the leading edge of the storm between the nose of the shelf cloud and where the gust front has reached, possibly 1 – 3 nm ahead of the rain curtain. Shear at the trailing edge is not quite as severe, as velocity there equals gust speed minus the speed of storm advance. then the ideal conditions are created for a severe multicell storm. Or a supercell storm if the surface wind is greater than 20 knots and the vertical wind shear exceeds about five knots for each 3000 feet. The capping inversion keeps the lid on development until the lifting force builds up sufficiently to burst through the inversion and great buoyancy develops in the colder upper layer. Upper level divergence and a jetstream will also enhance the vertical motion. Strong wind shear both tilts the updraught and provides the means to rotate it (storm updraughts usually do not rotate) leading to the development of a supercell storm. A supercell is a severe storm with a continuing, organised strong main updraught with usually slight rotation (helicity) and co-existing strong downdraughts, controlling and directing the inflow ( which may have a velocity of 30 – 50 knots) into the cell from the surrounding atmosphere. It will usually diverge to the left of the prevailing mid-level wind. There may be broad anti-clockwise rotation – as viewed from below – of the cloud base beneath the main updraught. 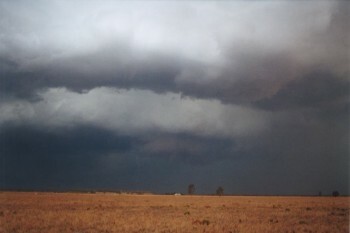 Humid, rain cooled air from the downdraught may also be pulled into the normal inflow (which is often visible as scud beneath the Cb) causing part of the cloud base to lower, forming a circular wall cloud at the updraught base, and if vorticity increases within the cloud, a tornadic funnel may form. A gustnado may form under a shelf at the leading edge of the gust front. Broadscale rotation of a storm cell forms a mesocyclone one to ten nm in diameter with a surface pressure drop of a few hPa at the centre although a 30 hPa drop has been recorded. Supercells may last for several hours as organised systems and commonly form in warm, moist north / north-east flow into a surface trough and along a dividing range during summer. A microburst is a strong concentrated plunge of cold dense air from a convective cloud. Peak wind gusts usually last less than ten minutes, often 3 to 5 minutes, but extremely hazardous vertical and horizontal shear results. It may be “dry” or associated with precipitation ranging from virga showers to heavy rain showers – “wet”. A curling outflow foot of dust or precipitation from the surface touchdown point may be visible near the surface. 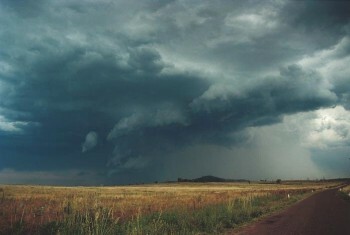 Microbursts are generally associated with hot and relatively dry conditions at low levels (such as found in inland Australia), convectively unstable moist air aloft with high (5000 to 15 000 feet) based Cu or TCu. If the cloud is forming when the surface temperature/dewpoint spread is 15 °C to 25 °C then the microburst potential is high. The high spread means the atmosphere can hold much more water vapour. Rain falling in, and from, the cloud is evaporating (virga), thus cooling the entrained air and resulting in downward acceleration of the denser air. 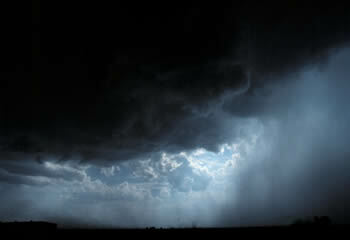 Consequently flight through, or under or near, precipitation from a large Cu involves risk. Significant hail is unlikely. The most dangerous area is the horizontal density current vortex ring close to the touchdown point. The ring moves outward from the contact point at high velocity (up to 150 knots) until it disintegrates into several horizontal roll vortices spread around the periphery and which may continue to provide extreme shear for several minutes. The maximum horizontal winds occur about 100 feet above ground level. Microbursts occur under 5% – 10% of Cb (refer 9.5 below) but a less concentrated, longer lasting gust front macroburst is normally associated with the entire cold air outflow of larger storm cells. The severe gust fronts from a microburst extend for less than 4 km, those from a macroburst extend for more than 4 km. The vertical gusts within the downburst, perhaps with a velocity twice the mean, may produce a microburst within the macroburst. The precipitation downdraught associated with an individual cell tends to be concentrated towards the leading edge of the storm where the cold heavy outflow spreads out at ground level forming a small high pressure cell, a meso-high, 10 – 15 nm across. The dense air lifts the warmer, moist air in its path and may initiate a self amplifying convective complex, in which neighbouring storm cells consolidate into a towering squall line of large thunderstorm cells ranged across the prevailing wind direction. At locations in the path of the squall line the resultant line squall occurs as a sharp backing in wind direction, severe gusts, temperature drop, hail or heavy rain and possibly tornadoes. If the squall line is formed in an environment of strong mid-level winds the surface gusts may exceed 50 knots. Squall lines vary in length, some of the longest being those which develop in a pre-frontal trough 50 -100 nm ahead of a cold front. These squall lines may be several hundred nautical miles in length and 10 – 25 nm wide moving at typically 25 knots. The pre-frontal lines form ahead of the front as upper air flow develops waves ahead of the front; downward wave flow inhibiting and upward wave flow favouring, uplift. During daylight hours the squall line may appear as a wall of advancing cloud with spreading cirrus plume but the most severe effects will be close to each of the numerous Cb cells. The convective complex releases a tremendous amount of latent heat and moisture which may be sufficient to generate a warm core mesoscale cyclone lasting several days. Flight through rain causes a water film to form over the wings and fuselage; if the rain falls at a rate exceeding perhaps 20 mm per hour the film over the wings is roughened by the cratering of drop impacts and the formation of waves. The effect, which increases with rainfall rate, is a lowering of the lift coefficient value at all angles of attack, with laminar flow wings being most affected and fabric wings least affected. The stall will occur at a smaller angle of attack i.e. the stalling speed increases; which is further compounded by the increased weight of the aircraft. The water film will increase drag and the encounter with falling rain will apply a downward/backward momentum which may be significant to a light aircraft. Propeller performance is degraded and water ingestion will affect engine output. Thus the rain effect can be hazardous when operating in conditions of low excess aircraft energy – typically when taking off, landing or conducting a go-around. Visibility through a windscreen may be zero in such conditions, so a non IFR-equipped aircraft will be in difficulties. The electrostatic structure within Cb, or Cu con, is such that pockets of different charge exist throughout the cloud but, in 90% or more, with a main net positive charge residing on the cloud ice crystals in the upper part of the cloud and a main net negative charge, of similar magnitude, centred near the middle or lower part of the cloud at the sub-freezing level, the charge mainly residing on supercooled droplets. A smaller positive charge centre may exist at the bottom of the cloud where temperatures are above freezing. The electrostatic forces of repulsion / attraction induce secondary charge accumulations outside the cloud, a positive region on the earth’s surface directly below the cloud. Above the cloud positive ions are transferred away from and negative ions are transferred toward the cloud. 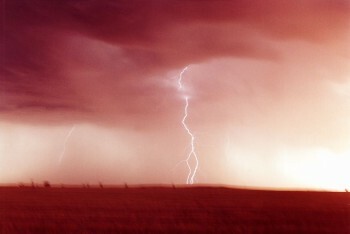 One favoured theory for the charge separation mechanism is the 'precipitation' theory which suggests that the disintegration of large raindrops and the interaction between the smaller cloud particles and the larger precipitation particles in the up / downdraughts causes the separation of electrical charge, with downward motion of negatively charged cloud and precipitation particles and upward motion of positively charged cloud particles. Lightning is a flow of current, or discharge, along an ionized channel that equalizes the charge difference between two regions of opposite charge, occurring when the charge potentials exceed the electrical resistance of the intervening air. These discharges can be between the charged regions of the same cloud (intra-cloud), between the cloud and the ground (cloud-to-ground), between separate clouds (cloud-to-cloud) or between the base of a cloud and a charge centre in the atmosphere underneath it (cloud-to-air). The discharge channels, or streamers, propagate themselves through the air by establishing, and maintaining, an avalanche effect of free electrons which ionize atoms in their path. Lightning rates, particularly intra-cloud strokes, increase greatly with increase in the depth of clouds. Cloud-to-cloud and cloud-to-air discharges are rare but tend to be more common in the high based Cb found in the drier areas of Australia. Discharges above the Cb anvil into the stratosphere and mesosphere also occur. When intra-cloud lightning – the most common discharge – occurs, it is most often between the upper positive and the middle negative centres. The discharge path is established by a “stepped leader”, the initial lightning streamer which grows in stages and splits into more and more branches as it moves forward seeking an optimal path between the charge centres. The second, and subsequent, lightning strokes in a composite flash are initiated by dart leaders, streamers which generally follow the optimum ionized channel established by the stepped leader. The associated electrical current probably peaks at a few thousand amperes. A distant observer cannot see the streamers but sees portion of the cloud become luminous, for maybe less than 0.5 seconds, hence 'sheet lightning'. Most cloud-to-ground discharges occur between the main negatively charged region and the surface, initially by a stepped leader from the region which usually exhibits branching channels as it seeks an optimal path. When the stepped leader makes contact, directly with the earth or with a ground streamer, which is another electrical breakdown initiated from the surface positive charge region and which rises a short distance from the surface, the cloud is short-circuited to ground and to complete each lightning stroke a return streamer, or return stroke, propagates upwards. (The return streamer starts as positive ions which capture the free electrons flowing down the channel and emit photons. The streamer carries more positive ions upward and their interaction with the free flowing electrons gives the impression of upwards movement.) The charge on the branches of the stepped leader that have not been grounded flow into the return streamer. Subsequent strokes in the composite flash are initiated by dart leaders with a return streamer following each contact. The return streamer, lasting 20 – 40 microseconds, propagates a current carrying core a few cm in diameter with a current density of 1000 amperes per cm² and a total current typically 20 000 amps but peaks could be much greater. A charged sheath or corona, a few metres in diameter, exists around the core. The stroke sequence of dart leader / return streamer occurs several times in each flash to ground, giving it a flickering appearance. Each stroke draws charge from successively higher regions of the Cb and transfers a negative charge to the surface. Return streamers occur only in cloud-to-ground discharges and are so intense because of the earth’s high conductivity. Some rare discharges between cloud and ground are initiated from high surface structures or mountain peaks, by an upward moving stepped leader and referred to as a ground-to-cloud discharge. Rather rarely an overhanging anvil-to-ground discharge can be triggered by heavy charge accumulation in the anvil and the high magnitude strike can move many kilometres from the storm – a 'bolt from the blue'. The temperature of the ionised plasma in the return streamer is at least 30 000 °C and the pressure is greater than 10 atmospheres, causing supersonic expansion of the channel which absorbs most of the dissipated energy in the flash. The shockwave lasts for 10 – 20 microseconds and moves out several hundred metres before decaying into the sound wave – thunder – with maximum energy at about 50 hertz. The shock wave can damage objects in its path. The channel length is typically 5 km and channel length can be roughly determined by timing the thunder rumble after the initial clap, e.g. a rumble lasts for 10 seconds x 335 m/sec = 3.3 km channel length. When a lightning stroke occurs within 150 m or so the observer hears the shockwave as a single high pitched bang. The lightning discharges emit radio waves – atmospherics or ‘sferics – at the low end of the AM broadcast band and at TV band 1, which are the basis for airborne storm mapping instruments such as Stormscope and Strikefinder. The NDB/ADF navigation aids also operate near the low end of the AM band so that the tremendous radio frequency energy of the storm will divert the radio compass needle. Weather radars map storms from the associated precipitation. When most aeroplanes, excluding ultralights, are struck by lightning the streamer attaches initially to an extremity, such as the nose or wing tip then re-attaches itself to the fuselage at other locations as the aircraft moves through the channel. The current is conducted through the electrically bonded aluminium skin and structures of the aircraft and exits from an extremity, such as the tail. 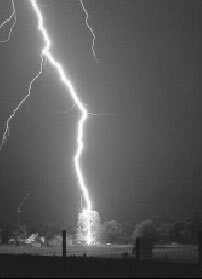 If an ultralight is struck by lightning the consequences cannot be determined but are likely to be very unpleasant. Ultralights particularly should give all Cbs a wide berth but supercells and line squalls should be cleared by 25 – 30 nm at least. Although a basic level of protection is provided in most light aeroplanes for the airframe, fuel system and engines, damage to wing tips, propellers and navigation lights may occur and the current has the potential to induce transients into electrical cables or electronic equipment. The other main area of concern is the fuel tanks, lines, vents, filler caps and their supporting structure, where extra design precautions prevent sparking or burn through. In heavier aircraft radomes, being constructed of non-conductive material, are at risk. When large cloud to ground lightning discharges occur below an extensive Cb cluster, which has a spreading stratiform anvil, other discharges are generated above the anvil. These discharges are in the form of flashes of light lasting just a few milliseconds and probably not observable by the untrained, naked eye but readily recorded on low light video. Red sprites are very large but weak flashes of light emitted by excited nitrogen atoms and equivalent in intensity to a moderate auroral arc. They extend from the anvil to the mesopause at an altitude up to 90 km. The brightest parts exist between 60 – 75 km, red in colour and with a faint red glow extending above. Blue filaments may appear below the brightest region. Sprites usually occur in clusters which may extend 50 km horizontally. Blue jets are ejected above the Cb core and flash upward in narrow cones which fade out at about 50 km. These optical emissions are not aligned with the local magnetic field. St. Elmo's fire is a plasma (i.e. a hot, ionized gas) that forms around the tips of raised, pointed conductors during thunderstorms. It is known as a corona discharge or point discharge to physicists. The few people that have had the privilege of viewing an actual St. Elmo's fire have given various descriptions. It has been seen with different physical characteristics depending on the conditions of the viewing. It could be blue to bluish-white, silent to emitting a hissing sound, and ghostly to solid. St. Elmo's fire occurs during thunderstorms - generally after the most severe part of the storm has passed - when the air reaches a very high voltage. These conditions are necessary to accumulate a charge large enough to create the phenomenon. It is always found attached to a grounded conductor with a sharp point; the most common are masts of sailing ships, church steeples, airplane wings or propellers, or even horns of cattle. The non-attached version of St. Elmo's fire is known as Ball Lightning. St. Elmo's Fire forms on aircraft flying through heavily charged skies, often as a precursor to a lightning strike. The glow can be seen concentrated on wing tips, antennae, the tail, nose and propeller blades when the potential difference is large enough. St. Elmo's Fire can be heard "singing" on the craft's radio, a frying or hissing sound running up and down the musical scale, according to some pilots. A British Airways 747 flight was flying at night in the South Pacific just after a volcanic eruption of Mt. Galunggung, in western Java. St. Elmo's fire was observed extending from the engines and sparking across the instrument panel, while smoke was smelled inside the passenger cabin. In minutes, the number four engine shut down, followed quickly by the remaining three. The aircraft glided from 37,000 feet to 12,000 feet before the crew was able to restart the engines and steer for an emergency landing at Jakarta. Ash appeared as smoke as it was sucked into the air conditioning system. The static electricity created by the ash hitting the windscreen and wings had created the St. Elmo's fire. Hail can cause considerable damage to aircraft and is usually encountered between 10,000 and 30,000 feet. At times it can also be found in clear air near thunderstorms. High humidity and low winter freezing levels provide likely conditions for icing at low levels. Hopefully it is unlikely that a VFR GA pilot would venture into possible icing conditions but pilots may be tempted to fly through freezing rain or drizzle. Aircraft cruising in VMC above the freezing level and then descending through a cloud layer may pick up ice. The airframe temperature, at the point where the liquid strikes the surface, must be sub-zero. Light: less than 0.5 grams per cubic metre of supercooled water in the cloud – no change of course or altitude is considered necessary for an aircraft equipped to handle icing. Very few light aircraft are equipped to handle any form of airframe ice. vModerate: between 0.5 and 1.0 g/m³ – a diversion is desirable but the ice accretion is insufficient to affect safety if anti-icing / de-icing used, unless flight continued for an extended period. Severe: more than 1.0 g/m³ – a diversion is essential. The ice accretion is continuous and such that de-icing / anti-icing equipment will not control it and the condition is hazardous. The diagram below shows the ice accretion in mm on a small probe for the air miles flown, in clouds with liquid water content varying from 0.2 g/m³ to 1.5 g/m³. The small, supercooled droplets in stratiform cloud tend to instantaneous freezing when disturbed and form rime ice – rough white ice, opaque with entrapped air. In the stable conditions usually associated with stratiform cloud, icing will form where the outside air temperature [OAT] is in the range 0 °C to –10 °C . The continuous icing layer is usually 3000 to 4000 feet thick. The larger supercooled droplets in convective cloud tend to freeze more slowly when disturbed by the aircraft; spreading over the surface and forming glossy clear or glaze ice . In unstable air moderate to severe icing may form where the OAT is in the range –4 °C to –20 °C . Where temperature is between –20 °C and –40 °C the chances of moderate or severe icing are small except in CB CAL i.e newly developed cells. Icing is normally most severe between –4 °C and –7 °C where the concentration of free supercooled droplets is usually at maximum, i.e. the minimum number have turned to ice crystals.. Mixed rime and clear ice can build into a heavy, rough conglomerate. Flying through snow crystals or snowflakes will not form ice but may form a line of heavy frosting on the wing leading edge at the point of stagnation, which could increase stalling speed on landing. Flying through wet mushy snow, which is a mixture of snow crystals and supercooled raindrops, will form pack snow on the aircraft. TCu and Cb; rime, clear or mixed ice, possibly severe. Freezing rain creates the worst icing conditions, occurring when the aircraft flies through supercooled rain or drizzle above the freezing level in Cu or Cb. The rain striking an airframe, at sub-zero temperature, freezes and glaze ice accumulates rapidly, as much as one cm per four miles. Freezing rain or drizzle occurring in clear air below the cloud base is the most likely airframe icing condition to be encountered by the VFR pilot and, as it is unlikely to occur much above 5000 feet amsl, descent choices are possibly limited. Ice accretion on the wing leading edge is a major concern for aircraft not equipped with anti-icing or de-icing. Airflow disruption will reduce the maximum lift coefficient attainable by as much as 30% – 50%, thus raising the stalling speed considerably. and, because the aircraft has to fly at a greater angle of attack to maintain lift, the induced drag also increases and the aircraft continues to lose airspeed, making it impossible to sustain altitude if the stall is to be avoided. Fuel consumption will also increase considerably. The weight of 25 mm of ice on a small GA aircraft would be about 30 to 40 kg but the increased weight is usually a lesser problem than the change in weight distribution. Also accretion is often not symmetrical, which adds to increasing uncontrollability. Forward visibility may be lost as ice forms on the windshield. Icing of the propeller blades reduces thrust and may cause dangerous imbalance. Ice may jam or restrict control and trim surface movement or may unbalance the control surface and possibly lead to the development of flutter. Communication antennae may be rendered ineffective or even snapped off. Extension of flap may result in rudder ineffectiveness or even increase the stalling speed. Aircraft operating from high altitude airfields in freezing conditions may be affected by picking up runway snow or slush which subsequently forms ice possibly causing engine induction icing, frozen brakes etc. Impact icing may occur at the engine air intake filter. If 'alternate air' (which draws air from within the engine cowling) is not selected, or is ineffective, power loss will ensue. When air is near freezing movement of water molecules over an object such as the air filter may sometimes cause instantaneous freezing. Ice may also form on the cowling intakes and cause engine overheating. Pitot or static vent blockage will seriously effect the ASI, VSI and altimeter, as shown in the table below, but be aware that blockage of the static vent tubing from causes other than icing, water for example, will render the ASI, VSI and altimeter useless, unless the aircraft is fitted with an alternative static source. Very few light aircraft are equipped for icing conditions. Devices include inflating rubber boots on the leading edges, heating coils and surfaces that exude antifreeze. Many aircraft however are equipped with storm scopes that give position and warning of approaching storm cells. Don't land or take off in the face of an approaching thunderstorm. A sudden gust front of low level turbulence could cause loss of control. Don't attempt to fly under a thunderstorm even if you can see through to the other side. Turbulence and windshear under the storm could be disastrous. Don't fly without airborne radar into a cloud mass containing scattered embedded thunderstorms. Scattered thunderstorms not embedded usually can be visually circumnavigated. Don't trust the visual appearance to be a reliable indicator of the turbulence inside a thunderstorm. Do avoid by at least 20 miles any thunderstorm identified as severe or giving an intense radar echo. This is especially true under the anvil of a large cumulonimbus. Do circumnavigate the entire area if the area has 6/10 thunderstorm coverage. Do remember that vivid and frequent lightning indicates the probability of a severe thunderstorm. Do regard as extremely hazardous any thunderstorm with tops 35,000 feet or higher whether the top is visually sighted or determined by radar. Tighten your safety belt, put on your shoulder harness if you have one, and secure all loose objects. Plan and hold your course to take you through the storm in a minimum time. To avoid the most critical icing, establish a penetration altitude below the freezing level or above the level of -15 °C. Verify that pitot heat is on and turn on carburettor heat or jet engine anti-ice. Icing can be rapid at any altitude and cause almost instantaneous power failure and/or loss of airspeed indication. Establish power settings for turbulence penetration airspeed recommended in your aircraft manual. Turn up cockpit lights to highest intensity to lessen temporary blindness from lightning. If using automatic pilot, disengage altitude hold mode and speed hold mode. The automatic altitude and speed controls will increase manoeuvres of the aircraft thus increasing structural stress. If using airborne radar, tilt the antenna up and down occasionally. This will permit you to detect other thunderstorm activity at altitudes other than the one being flown. Do keep your eyes on your instruments. Looking outside the cockpit can increase danger of temporary blindness from lightning. Don't change power settings; maintain settings for the recommended turbulence penetration airspeed. Do maintain constant attitude; let the aircraft "ride the waves." Manoeuvres in trying to maintain constant altitude increase stress on the aircraft. Don't turn back once you are in the thunderstorm. A straight course through the storm most likely will get you out of the hazards most quickly. In addition, turning manoeuvres increase stress on the aircraft.